Overview: Cleveland is famous for it’s Rock and Roll history, it’s Hall of Fame and its orchestra. My goal in creating the Cleveland Museum of Music on the lower level of the Detroit Superior Bridge is to transform Cleveland into The Music City. This Museum is another awesome opportunity for people of all ages to interact and experience music. 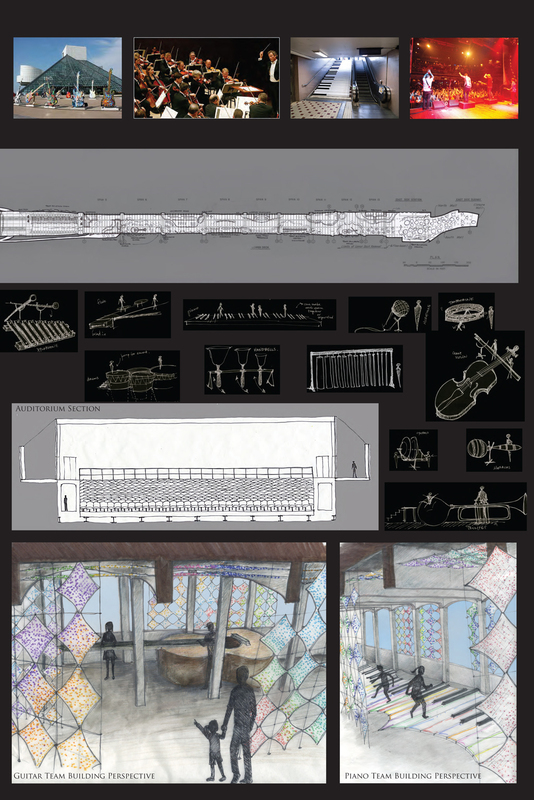 The most enticing features of the museum will be the large instruments that are placed along the museum path. 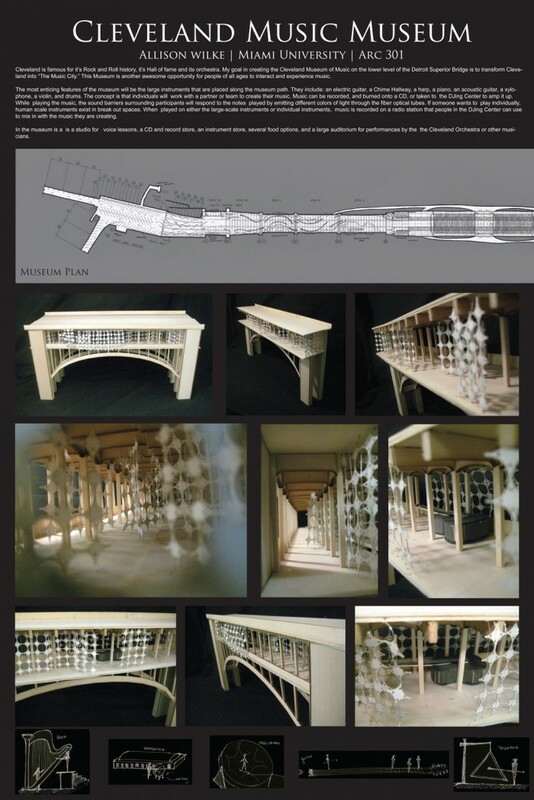 They include: an electric guitar, a Chime Hallway, a harp, a piano, an acoustic guitar, a xylophone, a violin, and drums. The concept is that individuals will work with a partner or team to create their music. Music can be recorded and burned onto a CD or taken to the DJing Center to get amped up. While playing the music, the sound barriers surrounding participants will respond to notes played by e mitting different colors of light through the fiber optical tubes. If someone wants to play individually, human scale instruments exist in break out spaces. When played on either the large-scale instruments or individual instruments, music is recorded on a radio station that people in the DJing Center can use to mix in with the music they are creating. 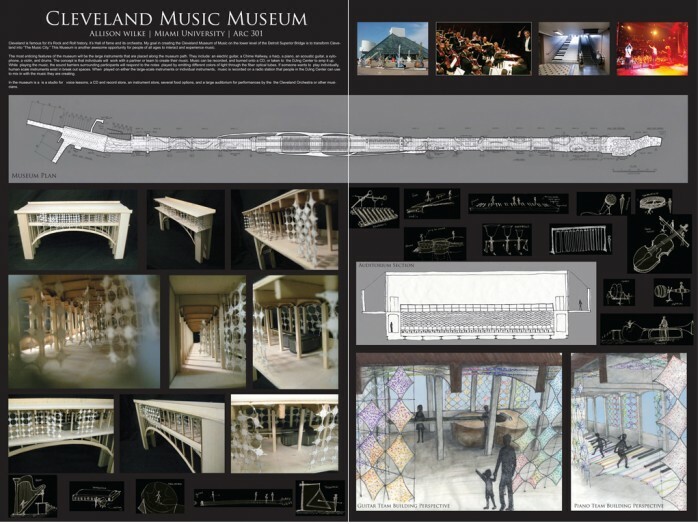 The museum has a studio for voice lessons, a CD and record store, an instrument store, several food options, and a large auditorium for performances by the Cleveland Orchestra or other musicians.